What Is a Phishing Scam? 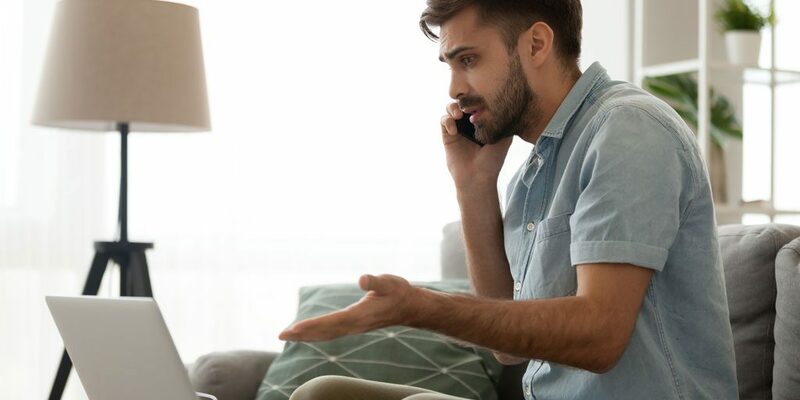 Anyone with a phone – no matter whether it’s a cell phone or a landline – is familiar with the annoying calls that come in on a regular basis from parties claiming that they are banks, lenders and credit card companies informing you of alarming activity on your account. And according to the voice on the phone, taking any action needed to rectify the situation requires the verification of name, address and the last four numbers of the account or card. It’s become all too common, these phone calls alarming you of what is a very real danger. But it’s also extremely fraudulent and very much a danger in itself. Which is why everyone in this day and age needs to know how to identify a phishing scam. The answer to the question, “what is a phishing scam,” is that it is not limited to phone calls. It also extends to emails with suspicious links that require you to click through. The general public is already accustomed to avoiding these emails, and so phishing scams have extended to voice phishing scams that seem more legitimate and more urgent. They also seem more unavoidable, as the immediacy of the so-called “danger” presented by the person on the phone is something that many people fall prey to. After the initial information is given and the fact of the “suspicious activity” is presented, along with the request for address and last four digits of the account, the so-called “bank official” or “credit card personnel member” often asks for the three-digit security code on the back of the card in order to verify that the card is yours. They might also ask for a personal identification number (PIN) or the answer to your online banking security question. The unsolicited call, coupled with the request for such information, is a classic sign of a phishing scam. Due to the fact that the caller has previously given enough correct details to make the call seem legitimate, many people give them everything they need to further their goal. Unfortunately, once they have the information requested of you they now have full access for any transactions they intend to make. Which means that their intimal claim of fraudulent activity is now a reality. Is It Real or Robo Phishing? The automated voice that sounds human at first but later reveals itself as a scripted robo-call is another answer to the question, “what is a phishing scam.” The automated voice call runs through the same “verification” process as the live phishing calls, but requests the entering of your PIN or CSV number when prompted. Phishing scams are successful because hackers use the tools they have and know the tricks of using them to their advantage. They use software to disguise their phone number to make it appear that the source is a trustworthy one. Then they supply a few basic pieces of information to you for the establishment of legitimacy. However, it is important to realize that a home address is easily found by an Internet search and the last four digits of a credit card are often on discarded or misplaced receipts. Some scammers even have the card number in its entirety, as this number is sometimes accessed through an online data breach and now simply requires the last component of a PIN or CSV number. One method of protection from a phishing scam is informing the caller that you will directly call them back for yourself. Legitimate callers agree to this without hesitation and allow you the courtesy of calling the actual 800-number provided on the back of your credit or debit card. Calling the bank on your own often reveals the entire situation as a scam. Even in the event that the caller attempts to keep you on the phone, it’s important not to remain on the line with them. Always contact the bank or credit card company directly. At Beacon Insurance Agency, our primary role is providing the insurance needs of churches, Christian schools and nonprofit organizations throughout the Gulf Coast. Safety and liability risks are a regular concern for churches and businesses using any type of banking methods for payment and purchases, so we encourage our clients to take advantage of our partnership with GuideOne Insurance and the exclusive access it provides to use safety resources that offer guidance in whatever risks they face. Know how to identify a phishing scam and how to prevent them from being successful! Call Beacon Insurance Agency to learn more about the insurance coverage and many safety resources we offer today!